Goodman Packing & Shipping | International/Domestic Art Shipping, Antique Shipping logistics and retail services. Local company, global reach . 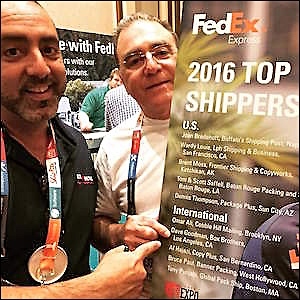 . .
We are proud to be one of the busiest Fedex locations in the United States. In 2016, we won second place. This year we're going all the way! We don't do it for the glory...We do it for our clients. Goodman Packing & Shipping/ Box Brothers LA - names you can trust. We've been supplying Moving Boxes, Shipping Boxes and Packaging Supplies since 1994 at our Box Brothers Los Feliz, Box Brothers Atwater and Box Brothers Hollywood retail stores. We have unparalleled expertise in art shipping services, packing, crating, storage, small moves, as well as dealing with valuable, delicate and unusual items. Our logistics and professional art shipping services are available worldwide to collectors, museums, galleries and individuals via our network of US affiliates, supported by International Shipping Centers in New York, London, Paris and Toronto. Goodman Packing and Shipping - International/Domestic Art Shipping, Antique Shipping logistics, retail boxes, supplies & services.